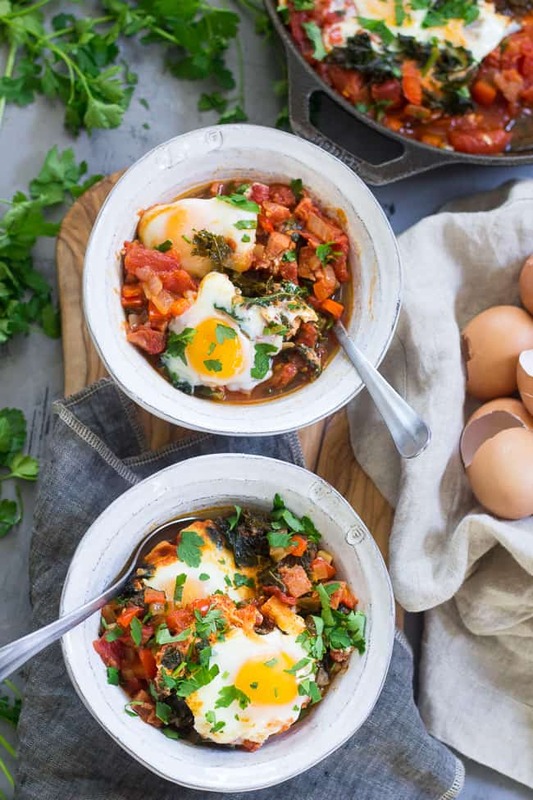 Eggs simmer in a spicy tomato sauce with kale and sausage in this savory and filling Shakshuka. 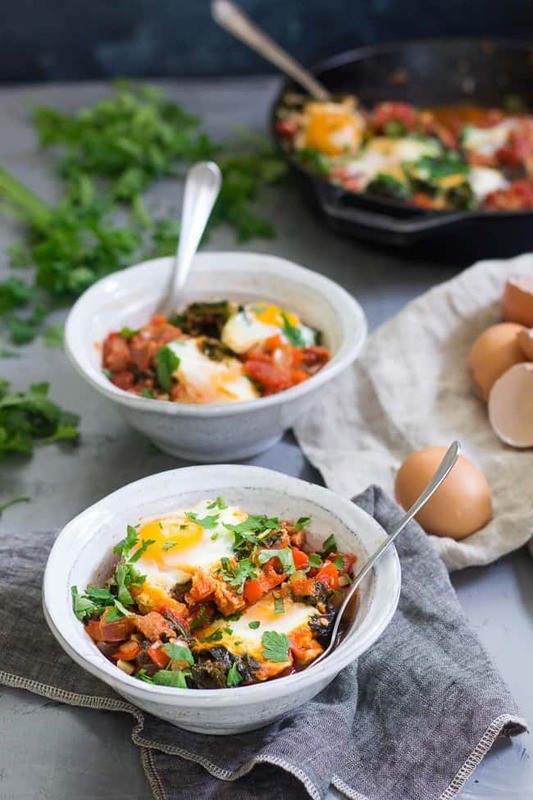 This Paleo and Whole30 Shakshuka makes a comforting and healthy meal for brunch, dinner, or whenever! If Saturdays are all about dessert, then Sundays need to be all about BRUNCH. Heck-to-the-oh-my-yes! 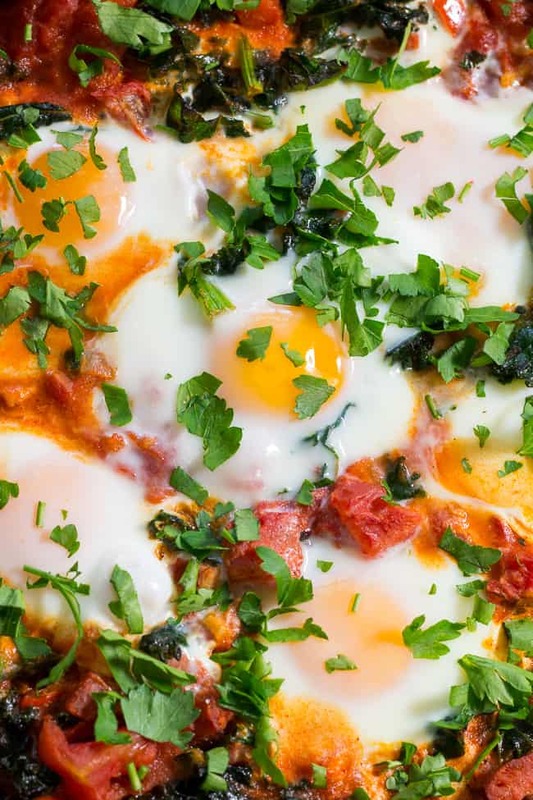 Savory, comforting, happy-making brunch recipes that involve eggs. Have I told you how much I love eggs? Did I even have to?! As if the hundred+ egg pictures on this blog gave me away or something. 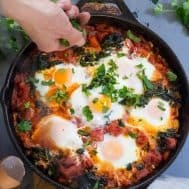 So yes, I love eggs, but oddly up until now, I had never made shakshuka. 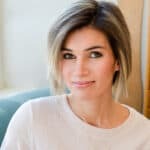 Crazy talk coming from me – it’s embarrassing. 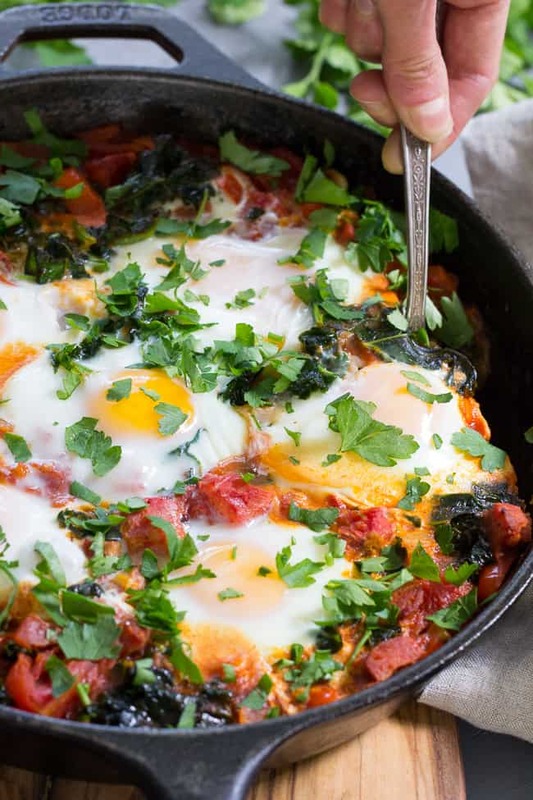 There’s really no good reason for not having at least attempted this traditionally middle eastern breakfast recipe, starring my favorite breakfast companion – eggs – which, according to Google, can be made hundreds of ways. 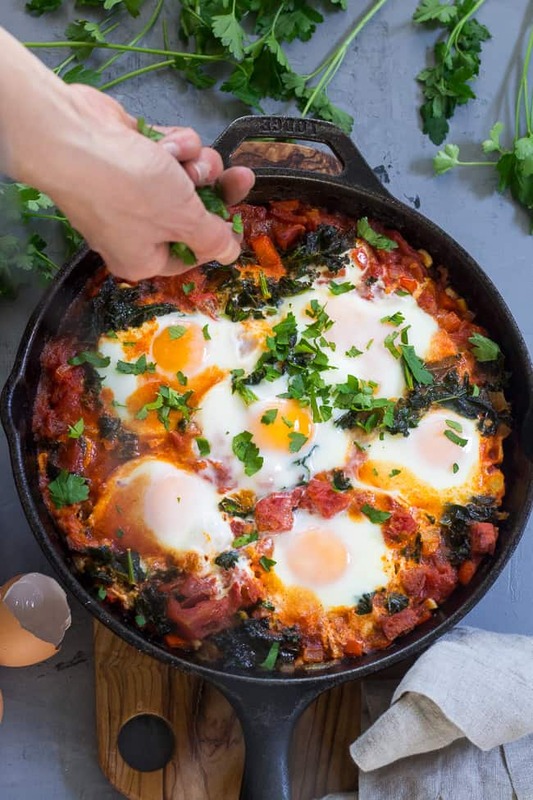 Seriously, it’s like everyone who has a skillet also has a shakshuka recipe. Well, now I have mine, and I’m certain it’s the first of many since I completely fell in love – no surprise. Anyway, I guess I won’t pretend that some people don’t eat bread with their shakshuka, it just happens to be totally unnecessary the way I made it here since it’s super filling as is. Sausage, kale, tomato and eggs. If you need to go toast, I say go sweet potato toast! Or simply bake yourself a sweet potato and go to town – carb-problem solved. 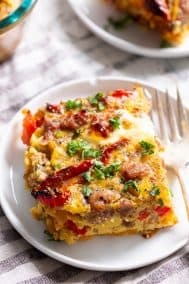 Another thing I absolutely love about this recipe – and really ALL big savory recipes involving eggs – is that it’s totally an anytime-meal. Breakfast, brunch, lunch, dinner – you simply can’t go wrong. It’s all made in one skillet and ready in 30 minutes, which makes it perfect to throw together on a lazy Sunday morning or after work on a weekday. I made enough to feed 4-6 people, but you can easily scale the recipe to suit the amount of servings you want. Are you guys ready for simmering egg heaven? Or hell, I suppose, given the fiery tomato sauce. Either way, total yumminess. Let’s cook! Preheat your oven to 400 degrees (to bake the eggs at the end), heat a large cast iron skillet over medium heat and add the ghee or other cooking fat. Once skillet is hot, add the onions and peppers and cook until the onions are translucent, stirring, then add the garlic and sausage and cook 2-3 more minutes. Create 6 spaces in the mixture and crack each egg right into the skillet, careful not to break the yolks. 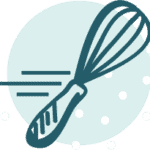 Sprinkle with salt and bake in the preheated oven for 10-15 minutes until eggs are cooked to preference. Remove from oven and garnish with chopped parsley before serving hot. Serve alone or with potatoes for a filling and delicious Paleo and Whole30 meal. **If preferred, you can blanch the kale prior to adding it to the skillet by adding it to boiling water for one minute, then draining. 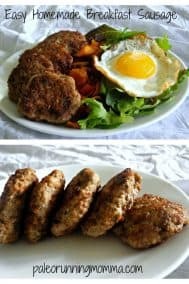 Want more savory Paleo brunch recipes? Try one of these! Favorite egg recipe of all time? How often do you do breakfast for dinner? Sure looks delicious and perfect to make ahead and bring to work! I have a breakfast fiesta casserole that I love with sweet potatoes, spicy ground turkey, taco seasoning and all kinds of veggies. 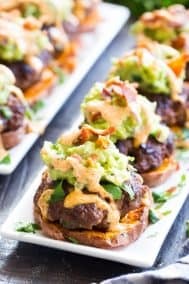 This looks like a really unique dish; I’ve seen a recipe on one other blog, and it sounds so fascinating. I would like to try it some day soon! WHAT ARE THE CALORIES IN A SERVING DO YOU THINK? I can calculate that for you, check back soon and it should be up! I made this last night and it was excellent. 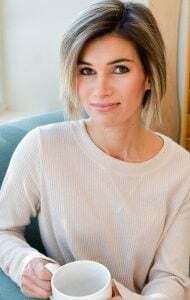 Served mine with a baked sweet potato and the husband with a baked russett potato and then chopped the potato up and cooked in a little butter, kind of like country hash browns. We both loved the sauce and eggs for dinner was wonderful. Very easy to put together and lots of depth of flavor. I will definitely be making this again. I used chicken andouille sausage. Love it, that sounds great! 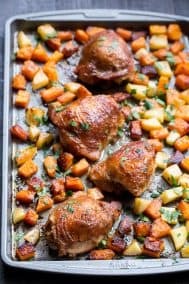 Made this tonight and served over roasted potatoes – so delicious! both my husband and I raved about the flavor, nice spiciness, and so satisfyingly filling. 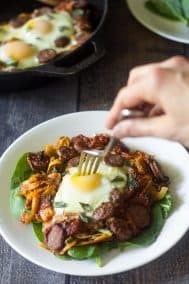 This is one of my favorite Whole30 recipes now. Heck, this is one of my favorite recipes period! Thank you for sharing it! Oh that’s so great to hear – thrilled you loved it! This was very easy and absolutely delicious. 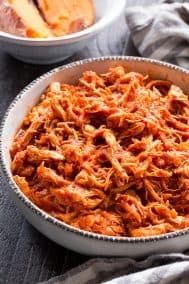 The sauce is deep and flavorful and I use the any left over sauce with other things like chicken. I baked a Japanese sweet potato for myself, although you don’t really need it but it adds something to the presentation. 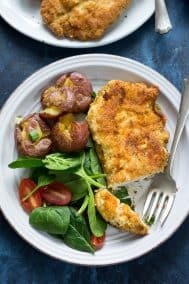 For my husband I used a baked russet potato and he found the dish to be satisfying, flavorful and filling. I make this over and over as it is simple to put together. 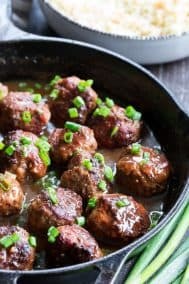 I made this a few nights ago with hot Italian sausage that I had on hand and it was absolutely delicious! This will be part of our meal rotation from now on. Thanks for the great recipe!